Nine UO offices are joining 34 others with Green Office certification from the UO Office of Sustainability. 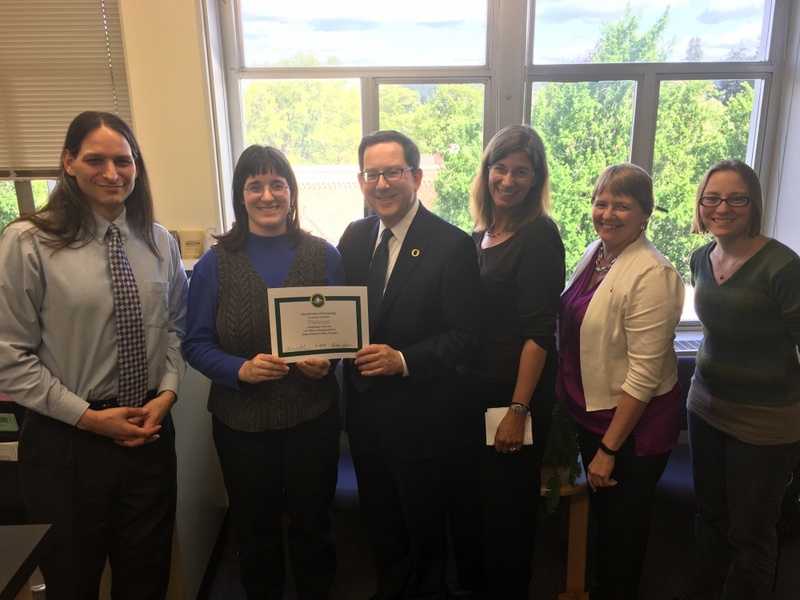 President Michael H. Schill recently presented the UO Department of Sociology its certificate and thanked staff for earning the highest score this year. The Department of Sociology sought additional funding to get new motion sensor lights installed in its common areas. The School of Architecture and Allied Arts dean’s office and College of Arts and Sciences’ Department of Geography also earned platinum certificates. The Department of Geography invites people to check out its new recycling and composting system due to arrive soon. The office developed the Green Office Certification Program to promote decentralized environmental initiatives under a common framework and reward campus units for participating. The program was updated last fall to include resiliency and was rebranded as the Green Resilient Office Certification Program. The scorecard now includes a section on disaster preparedness and awards points for having staff attend emergency preparedness training, sign up for UO Alert and complete CPR certification. The GRO certification is valid for four years. Platinum: Department of Sociology, School of Architecture and Allied Arts dean's office and Department of Geography. Gold: Mills International Center, campus planning, UO Zero Waste Program and Holden Center for Leadership and Community Engagement. Bronze: Athletics business office and Department of Economics. The certification process includes attending a lunch orientation, completing a scorecard based on the department’s practices, and completing a thorough certification process. Certification is a significant achievement and has helped promote sustainability best practices across campus.